At Madison Square Garden on St. Patricks Day Saturday night over ESPN Top Rank Promotions put on a good seven fight promotion with two title fights including Jose Carlos Ramirez and Amir Imam in the Main Event. In the tenth round Imam landed a triple jab to the chin of Ramirez driving him backwards. A Ramirez hard left hook drew blood from the nose of Imam. Ramirez landed several punches to the head of Imam. In the eleventh round Imam landed a triple jab to the chin of Ramirez but was countered by a double left hook to the body and head by Ramirez. Ramirez drove Imam into the ropes. Ramirez countered a jab with a left hook and right to the chin of Imam. Both were landing punches at the bell. 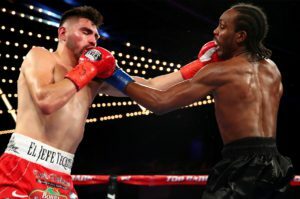 In the twelfth and final round Ramirez drove Imam backwards with a double jab followed with a right to the chin of Imam. They were landing punches at the bell with referee Ricky Gonzalez getting between them at the bell. In the fourth round Gvozdyk landed a flurry of punches driving Amar back against the ropes. Halfway through the round Gvozdyk landed a power right to the chin of Amar knocking his head back. Amar landed a good left hook to the chin of Gvozdyk prior to the bell. In the fifth round Gvozdyk landed a 3-punch combination to the body and head of Amar. Amar worked on the body of Gvozdyk. 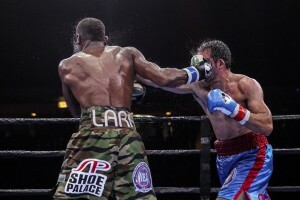 In the sixth round Amar landed a chin followed by a right uppercut to the chin of Gvozdyk. Gvozdyk continued to control the fight. On Saturday night Top Rank Boxing will return to the Theater at Madison Square Garden to televise three fights on ESPN for a St. Patrick’s Day Boxing special. The WBC Lightweight World Title as well as the WBC Interim Light Heavyweight World Title will be on the line and televised. Irish Olympic Hero Michael Conlan will also be fighting on the televised portion of the card. 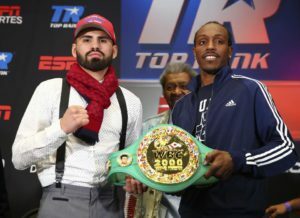 The untelevised undercard will feature some of Top Rank’s best prospects, including Christopher Diaz and Felix Verdejo. The following is a preview of the three televised bouts on the card. The opening bout of the night will be between Irish Superstar Michael Conlan and Hungarian boxer David Berna. Berna is one year older than Conlan and has some power in his hands. He has stopped fourteen of his opponents and only has one win by decision. His two losses however were by stoppage. Conlan has four stoppage victories on his resume and will have about a half inch height advantage over Berna. Conlan has a large edge in amateur experience. He competed in the 2012 and 2016 Summer Olympics while Berna has no such experience. Conlan has not faced significant opposition at this point of his career. He has defeated the likes of Luis Molina and Kenny Guzman. Berna’s only good win on his resume was against Jozsef Ajtai. He stepped up in competition twice and was stopped both times. His losses were to Toka Kahn Clary and Oleg Malynovskyi. Berna should be able to test the chin of Conlan, but Conlan is too much of a polished boxer for Berna to give him problems. Oleksandr Gvozdyk is another Ukranian boxer that had a successful amateur career signed by Top Rank Promotions. Gvozdyk is tall for his weight class, he stands at 6’2” and has a 75 ½” reach. He’s thirty years old and only has a few years left in his prime, but he’s five years younger than his opponent Mehdi Amar. Amar has only fought once in 2017 and twice in 2016. Gvozdyk has been very active and fought twice in 2017 and four times in 2016. Amar has sixteen stoppage wins on his record and one stoppage loss. He has fought exclusively in Europe during his career and has no notable victories. His losses were to Robert Stieglitz, Nadjib MOhammedi, Mehdi Bouadla, Hassan N’Dam N’Jikam, and Pierre Moreno. Gvozdyk has stopped twelve of his opponents and never tasted defeat. He has defeated the likes of Craig Baker, Yunieski Gonzalez, Isaac Chilemba, Tommy Karpency, and Nadjib Mohammedi. Gvozdyk was also a bronze medalist in the 2012 Summer Olympics. On paper, this is the biggest mismatch of the night. Gvozdyk should be able to win quite easily over the French boxer. The main event of the night will be between the undefeated Jose Ramirez and the one loss prospect Amir Imam. Ramirez and Imam are about the same height but Imam will have a slight one and a half inch reach advantage over Ramirez. Both boxers are in their prime and Imam one year older than Ramirez. Ramirez has been the busier boxer of the two. He fought twice in 2017 and three times in 2016. Imam fought twice in 2017 and only once in 2016. Imam has eighteen stoppage victories and four of his past fights were wins by KO/TKO. His lone loss was a major upset TKO loss to Adrian Granados. He has defeated the likes of Johnny Garcia, Walter Castillo, Yordenis Ugas, Fidel Maldonado Jr.
Ramirez has never tasted defeated but has defeated the likes of Mike Reed, Johnny Garcia, and Issouf Kinda. Ramirez has the edge in technical skill and competed in the 2012 Olympics. Imam lost to Errol Spence Jr. in the 2012 US Olympic Boxing trials. This should be a competitive fight and Imam has the power to pull off a surprise victory, but Ramirez should win a close decision.